Marilyn brings a unique perspective and skill to real estate. Not only has she represented clients in the purchase and sale of their homes, she is also a homebuilder. 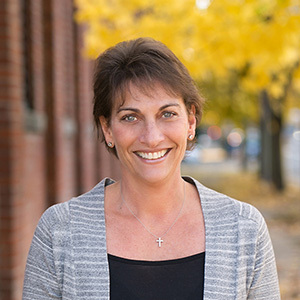 She grew up in the real estate development business with her family building custom homes and developing land in and around Portland. Today, Larry Brown Inc. is still building homes after 55 years and Marilyn and her brother Scott continue the tradition. Marilyn is involved in every aspect of home construction and brings that expertise to her clients. Her knowledge of land, home design and interiors is a unique benefit to clients. She has been a real estate broker for over 25 years and has guided buyers and sellers to numerous successful transactions. Her construction knowledge has been particularly helpful when her clients are looking at remodeling a home. She also has a background in commercial real estate where her family owns and manages apartments and office buildings. Marilyn is a native Oregonian returning to Portland after graduating from Santa Clara University. She loves to exercise and cook, enjoys the beach and any ray of sunshine that she can find! She and her husband Lee have two children. Hard to find new construction in the SW Hills by Shelburne. Lincoln HS Large open floor plan. A cooks dream! SS Viking Pro appl, Quartz, granite, tile, stone fireplace, French oak floors. Spa like master suite. Deck overlooking valley view. Large picture windows,walk in closets, high ceilings, guest suite on main level cherry stained cabinets,laundry on upper level.Owner is licensed real estate broker in Oregon. Charming St. Paul home near the heart of town. Huge lot with one level home. Inviting front porch, newer roof,large living room. Ready for your interior touches. Huge yard with lots of opportunities. Watch the St. Paul Rodeo from your front porch. Half acre opportunity to build close in. Gentle slope in this sought after neighborhood. Buyer to perform due diligence as to zoning and building feasibility. Flat half lot in Raleigh Hills with build to suit opportunity. One level living in 3500 SF custom designed home ready for your interior selections. Three car garage, cooks kitchen, five bedrooms,large covered outdoor area, bonus and den. Use current plan or have buyer build their own dream one level plan. Plan available for showing. Agent related to seller. Immaculate- move right in! Great floor plan. Open and light, Remodeled in 2012 w roof,granite, SS gas app, Blinds, AC, Fenced back yard, Huge master suite, family room off kitchen great room feel, Vaulted ceilings, Great floor plan! Awesome location! Near transit, downtown, multnomah village, garden home area. 823 ft from 45 acres to Woods Natural Park Area, plus 4 other parks near. 15 min to City, close to Multnomah Village. Quiet side of building, Charm Galore, Hardwoods, 9Ft ceilings, crown molding, bay windows, Gallery Hallway, period fixtures and details. On site manager. Roof top garden deck,storage,Next to Art museum, park,restaurants, shops. Across the street take light rail to airport and etc, bus lines. Parking spot! xtra storage in basement, bike storage, laundry in basement. Guest room avail, Unique & one of a kind! Exquisite builder’s home. Rich,elegant interiors make this an extraordinary property. Entertaining inside and outside is easy.The grand great room with concrete cast massive fireplace opens onto an outdoor living area with fireplace,pool and wall of water.Enter the master suite for a spa like experience including a steam shower. Create fabulous meals in the chef’s kitchen. Heated garage space for five cars, smart technology throughout. One of the premier Arlington Heights homes. Traditional meets cool contemporary in this remodeled classic home. Masterfully designed with attention to every detail. Exceptional kitchen with fireplace open to outdoors. Guest suite over garage, sport court,grassy area, incredible outdoor entertaining area with fireplace. Best of city living & neighborhood. Steps away from Forest Park, Japanese Garden, Zoo, Rose Gardens, tennis courts. An ultimate living experience was created by blending modern day needs with the charm & warmth of a traditional home. Extensive attention to detail & design is evident in every room. The kitchen is an entertainers dream. Fantastic outdoor living areas. The floor plan allows for larger gatherings or intimate nights in front of one of four fireplaces. Located on a culdesac near Portland Golf Club & the centrally located RaleighHills area. New Construction by Larry Brown Inc. in the heart of Raleigh Hills. Master on Main, two story stone fireplace in great room, 3 add’l bedrooms and bonus with walk in storage. Hardwood floors, custom cabinets, gated community of 8 homes. Listing Broker is Owner. New construction in Raleigh Hills by Larry Brown Inc. Near OES & Jesuit. Main level living with great room has a 2 story stone fireplace. Master suite with walk in closet and walk through to utility room. Open kitchen with wet bar adjacent to formal dining room. Lovely courtyard. Rear yard features fire pit and covered outdoor living. All high end finishes with real hardwood floors. Heated walk in storage. Gated street. Owner is agent. Private country estate in the city! Raised beds, pond and chicken coop. Exceptional remodel of this 1913 farmhouse while retaining original craftsmanship. Enjoy cooking in the open farm kitchen and dining on the covered porch as you gaze out to the lily pond. Completely private. ADU over garage with full kitchen, living, bedroom, bath and laundry. Seller is licensed real estate agent in Oregon. OPEN SAT 6 2 11-5 Impeccably cared for one level in Montclair. 4 bedrooms, family room, dining living combo with fireplace. Spacious kitchen with south facing windows, granite counters, plank wood floors. Superior storage and 3 car garage. Level yard with pool patio.Plantation shutters and more! Master on the main in this custom built home. Great room with gas fireplace and built ins.Kitchen with Subzero, Wolf,Bosch appl. Two bedroom suites and den with built ins upstairs. Huge bonus room and 400 SF walk in storage. Window seat, extensive woodwork, Cherry hardwoods, formal dining with butlers, pantry.Freshly painted inside and out. Cul-de-sac neighborhood across from Cedar Park School and Cedar Hills Rec Center. OPEN SUN 1-4 Custom built 4 bedroom home with private yard on a culdesac.Open floor plan,formal living and dining, butlers pantry,family room AND bonus room.Kitchen has Sub Zero,Wolf,Bosch.Master has sitting area.Large master bath with walk in closet,3rd bedroom is a suite.4th bedroom on main can be a den.Tons of built ins in garage.Built in vacuum,sound system,alarm,two HVAC systems. Listing agent is related to seller. Classic brick home in Raleigh Hills across from Portland Golf Club. Main level living,perfect for entertaining. The great room opens onto a covered patio. The hearth room and kitchen are ideal for informal eating and enjoying the fireplace. Kitchen features Subzero, Jenn Air. Den with a wet bar opens onto a deck with view. Den can be a be 4th bedroom. Great location in Wilcox Estates. Enjoy the pool and tennis court this summer! Remodeled kitchen opens to a fenced one third acre level yard. Master suite and guest baths have been updated. Hardwoods, granite kitchen counters, tile baths. Family room with fireplace. Great storage. Wonderful location on cul de sac with Bridlemile and Lincoln schools. Just what you are looking for! 4 bedroom, 3 full bath Renaissance built home with high quality upgrades.Separate den on main.Vacuum system,wooden blinds,remodeled master shower,granite, chef’s kitchen,high efficiency AC,smart panel,fenced yard with deck and patio.Great room with built-ins and fireplace. Built in desk alcove.Formal dining. Large master with walk in closet. Near Cooper Mtn. park. Live the creekside life. Custom designed home on 1 acre. Master on the main with fireplace overlooking creek. Wonderful mature landscaping provides private setting for entertaining and enjoying nature.Relax on the deck or view the wildlife from the family room. Formal dining and living room with fireplace and high ceilings.Office 4th bedroom on main,two bedrooms and bath upstairs. Huge utility and sewing room on main level. Mid Century Modern on half acre. This 4 bedroom home has gleaming hardwoods, two brick fireplaces, a walk out lower level and large picture windows in the living room. Very bright and open overlooking adjacent half acre also for sale. Original immaculate condition. Lower level could be separate living quarters. Hard to find in SW mid century! Fantastic location in Bonny Slope. High ceilings with open floor plan and hardwood floors. Office off of great room with doors to patio area. Huge master suite with vaulted ceiling. Relax on the front porch. HOA covers landscaping.Exterior painted 2017. Easy living in this day ranch with incredible yard near St. Vincent Hospital and Catlin Gabel.Imagine the possibilities on this almost half acre close-in home.Remodeled kitchen with contemporary feel. Southern exposure provides great natural light. Lower level family room has fireplace. Hardwood floors, Fisher Paykel appliances,fabulous storage. Newer windows, remodeled main floor bath and covered deck off dining living room. Fantastic setting for this private, well maintained home on Turner Creek. Views from the deck, great room and master suite. Kitchen with pantry, 2nd bedroom has walk in closet, bonus loft area upstairs. Great room plan with gas fireplace and built ins. Deck off of kitchen overlooking preserve. This home is absolutely immaculate! One owner has maintained it so well. Appliances included. newer roof. Nice ranch on one level with large, flat yard. Cul de sac location offers quiet neighborhood. Walk to Cooper Park. Open floor plan with one year old roof. Well maintained, newer appliances, new garage doors.All appliances included. Fantastic location, one block to OHSU. Zoned R-1. Private corner lot with small fixer home. Please verify school boundaries as they are changing.Buyer to verify zoning and allowable uses. Fantastic location adjacent to OHSU. Original home with hardwoods. Walk to OHSU. Very private corner lot. Please verify school boundaries as they are changing. This 3,979 sq’ oceanfront home has one of the most desirable lot locations in Cannon Beach. A very well built & designed home featured on 2 lots, gives way to 100′ of expansive ocean views. Has a personal beach access with a 2 minute walk to the downtown core. Two stories includes 4 bdrms, 4.5 bths with a oversized 2 car garage. Open floor plan with 9′ ceilings on 1st floor. 2 master suites, 3 fireplaces. A real treasure, Won’t last! Architect owner redesigned and remodeled this spectacular Broadmoor home with custom features from top to bottom!Gourmet kitchen with Sub Zero,Blue Star 6 burner range,quartz counters,soft close cabinets,walk-in & butler’s pantries.Fabulous main floor master suite.Covered patio w heaters & outdoor kitchen.Private,.34 acre lot,fire pit,landscape lighting,hot tub,raised beds,fountain.Close-in location on a quiet street. Gorgeous traditional home in Broadmoor. Stunning kitchen remodel with custom built cabinetry, granite countertops. Welcoming open entry w formal liv & din. Potential for 2nd master suite. Office could be a 5th bedroom. Upper level fam rm. Newly painted exterior, newer roof, electrical panel & sewer line. Nice sized backyard fully fenced w garden shed. 676 unfinished basement great for storage. Loads of charm thru out this home. DO NOT CALL SELLERS: LISTING IS EXTENDED; STATUS IS PENDING contemporary lives large in the Lewis & Clark neighborhood on a.38 acre quiet lot!Two fam rm areas, Master on sep level, 3 remodeled baths, quartz breakfast island, stnlss appls, new roof, new ext int paint, extensive windows, fenced yard & ovrszd garage! LOCATION! ! This is it! Traditional with 4BD + Bonus in OAK HILLS! Newer Furnace, Water Heater, Plumbing, Roof, Siding, Ext & Int Paint, Bathrooms & more! Light filled rooms, plantation shutters, huge storage shed off the garage, level grassy yard with lighting, entertaining deck and water feature. Short distance to pool, park, rec center, school & more! Come see this one before its gone! Wonderfully warm & inviting end unit built by Renaissance. Elegant high ceiling rooms boast Cherry hardwood floors, fireplace, kitchen with all the desired bells & whistles, spacious master, large walk in closet, giant soaking tub, media exercise room, AC, built in vacuum & covered deck. Resort style community with trails, dog park, & party room. Short distance to Sunset Transfer station, shopping, restaurants, freeway & downtown. This beautiful home is located in desirable Peterkort Village. Beautifully landscaped backyard with large slider doors looking out to enjoy all year round. Kitchen open to Great room with cozy fireplace. Formal Dining area. 3 bedrooms, den, and bonus room. Lots of space for living and entertaining! Immaculate home with a territorial view on a quiet street in the popular Bonny Slope neighborhood. The spacious gourmet kitchen with granite counters, hardwoods, stainless appliances and large pantry opens to the great room with 10 foot ceilings and a warm fireplace. You’ll appreciate the vaulted ceilings and large closet in the luxurious master suite. Convenient to Intel, downtown and Nike, this low maintenance home is ready to enjoy! Beautifully well-maintained home with master on the main. 5 bedrooms and 2 full baths plus large bonus room, great for entertaining! Hardwood floors in kitchen with granite counter tops. Updated bathrooms with new flooring and granite counter tops. Fully fenced backyard with custom decking and raised garden beds. Double garage, gas heat & central air. Quiet & serene backyard. A MUST SEE! VERY COZY HOME! OPEN HOUSE- SUNDAY 12-2PM!! Secluded view property in the private and prestigious gated Parrett Mountain Estates Community. Live in this tranquil country setting, minutes from all the conveniences of Sherwood and only 22 miles from Portland. Have your custom dream home built here and you may never want to leave. Water is covered in HOA fees! Great views of the coast range and valley below. More pics soon! Visit The-Estates.com for more info.